Scissors are cutting instruments consisting of a pair of metal blades connected in such a way that the blades meet and cut materials placed between them when the handles are brought together. The word shears is used to describe larger instruments of the same kind. Shears have blades longer than 6 in (15 cm) and often have one small handle with a hole that fits the thumb and one large handle with a hole that will fit two or more fingers. The largest shears are used to cut metal or to trim shrubs and must have very strong blades. Grass shears: Grass shears differ from pruning shears in being long-handled and having the handles at right-angles to the blades. They can be used to cut grass from a standing position. Two kinds are available: with the blades horizontal and with the blades vertical. Horizontal blades are used to remove grasses which have not been cut by the lawn mower. Vertical blades are used for trimming the edges of a lawn. Kitchen shears A kitchen tool, specifically made for food preparation, that is more versatile than a standard pair of cutting scissors. This utensil is made with a plastic or rubber coated handle which are often textured allowing for ease of cutting and gripping. The blades have a notch for cutting through poultry joints. Various parts of the handle may have teeth to be used for opening jars and bottles, as well as having a screwdriver-like protrusion to pry off lids. The scissor consists of two separate sections or sides that work together to cut, which may be riveted together or may be detatchable so each half section can be easily washed and dried. The blade is sturdy and made from aluminum or stainless steel.Many shears are built to handle the cutting of thin bones such as those when butterflying chicken breasts, so if chores of this nature are desired, make sure the blades are built to allow forceful cutting without excessive or unbalanced pressure. Pinking shears: have zig-zag blade edges that "pink" or cut paper or cloth with the same zig-zag. The purpose may be decorative or to help keep fabric from raveling. Lever Shears A shears in which the input force at the handles is related to the output force at the cutting edges by the principle of the lever. Also known as alligator shears; crocodile shears. A cutting tool with a fixed lower blade and a movable upper blade (shearing arm) that moves in an arc around a fulcrum pin; used mainly for shearing applications that do not require great accuracy. The earliest scissors known to exist appeared in the Middle East about 3,000 or 4,000 years ago and were known as spring scissors. They consisted of two bronze blades connected at the handles by a thin, curved strip of bronze. This strip served to bring the blades together when squeezed and to pull them apart when released. Steel shears of a similar design are still used to cut wool from sheep. Pivoted scissors of bronze or iron, in which the blades were connected at a point between the tips and the handles, were used in ancient Rome, China, Japan, and Korea. Despite the early invention of this design, still used in almost all modern scissors, spring scissors continued to be used in Europe until the sixteenth century. During the Middle Ages and Renaissance, spring scissors were made by heating a bar of iron or steel, then flattening and shaping its ends into blades on an anvil. The center of the bar was heated, bent to form the spring, then cooled and reheated to make it flexible. Pivoted scissors were not manufactured in large numbers until 1761, when Robert Hinchliffe of Sheffield, England, began using cast steel to make them. Cast steel, recently invented at the time by Benjamin Huntsman, also of Sheffield, was made by melting steel in clay crucibles and pouring it into molds. This resulted in a more uniform steel with fewer impurities. During the nineteenth century, scissors were hand-forged with elaborately decorated handles. They were made by hammering steel on indented surfaces known as bosses to form the blades. The rings in the handles, known as bows, were made by punching a hole in the steel and enlarging it with the pointed end of an anvil. The iron is first melted at the foundry and run into moulds of the different shapes desired. The steel is run into thin sheets, which are cut into strips, and these are punched, and riveted to the iron by one blow of a hammer. These pieces are then dipped in water and again in powdered borax, to cleanse the surfaces of the iron and steel, which would not unite without this process. After being heated red hot in a furnace, the two metals are welded together, and shaped by a die or stamp. A large pair of shears is used to trim the steel, that protrudes over the blades; after which the blades pass through the hands of a number of workmen, each doing his part towards shaping the shears. They are hardened by being plunged while red hot into a tank of cold water, which renders them very brittle. To remedy the brittle-ness they are put on a plate and again heated, until the workman knows by the color that they are properly tempered or toughened. After various processes, in one of which the hole for the screw is drilled, a temporary screw is put in, and the points and handles adjusted. This screw is taken out and the blades are numbered, in order that they may be kept in pairs. They are ground on a round stone, making a slight hollow on the surface of the blades; this forms an edge to cut on. A small elevation is also made close behind the screw, which causes the blades to cant more and more towards each other as they are closed. Then the handles are japanned or nickel-plated, and the blades are polished on emery wheels. After this they are taken to a stamping-machine, where the maker's name is put on them. Then the edges of the blades are sharpened on fine emery wheels, the screw is put in, and the blades adjusted. Lastly they are carefully inspected, packed in boxes, and are ready for market. Gardening is the practice of growing ornamental or useful plants. Ornamental plants are normally grown for their flowers, foliage, or overall appearance. Useful plants may be grown for consumption (vegetables, fruits, herbs, or leaf vegetables) or for a variety of other purposes, such as medicines or dyes. A gardener is someone who practices gardening. Residential gardening: takes place near the home, in a space referred to as the garden. Although a garden typically is located on the land near a residence, it may also be located on a roof, in an atrium, on a balcony, in a windowbox, or on a patio or vivarium. Non-residential: green areas, such as parks, public or semi-public gardens (botanical gardens or zoological gardens), amusement and amusement parks, along transportation corridors, and around tourist attractions and garden hotels. In these situations, a staff of gardeners or groundskeepers maintains the gardens. Indoor gardening: Is concerned with the growing of houseplants within a residence or building, in a conservatory, or in a greenhouse. Indoor gardens are sometimes incorporated as part of air conditioning or heating systems. Water gardening: is concerned with growing plants adapted to pools and ponds. Bog gardens are also considered a type of water garden. These all require special conditions and considerations. A simple water garden may consist solely of a tub containing the water and plant(s). Container gardening: is concerned with growing plants in any type of container either indoors or outdoors. Common containers are pots, hanging baskets, and planters. Container gardening is usually used in atriums and on balconies, patios, and roof tops. Community gardening: is a social activity in which an area of land is gardened by a group of people, providing access to fresh produce and plants as well as access to satisfying labor, neighborhood improvement, sense of community and connection to the environment. Community gardens are typically owned in trust by local governments or nonprofits. Shared gardens: Garden sharing partners landowners with gardeners in need of land. These shared gardens, typically front or back yards, are usually used to produce food that is divided between the two parties. In part because of labor intensity and aesthetic motivations, gardening is very often much more productive per unit of land than farming. In the Soviet Union, half the food supply came from small peasants' garden plots on the huge government-run collective farms, although they were tiny patches of land. Some argue this as evidence of superiority of capitalism, since the peasants were generally able to sell their produce. Others consider it to be evidence of a tragedy of the commons, since the large collective plots were often neglected, or fertilizers or water redirected to the private gardens. Garden shovels have round, pointed blades. 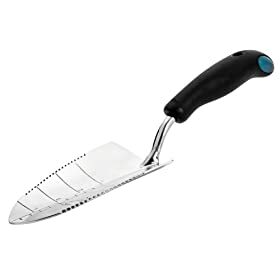 They're absolutely necessary for moving soil, digging holes and planting.. Look for one with a flat edge at the top of the blade. It provides a better surface for your foot. Most planting will require you get down on your knees with a trowel. Steel blades will last longest. Handle choice is a matter of personal preference. Soft rubber handles are easier on the grip. There are also ergonomic designs that take the stress off of your wrist. A narrow blade is good for digging in solid soil. Wide, rounded blades remove soil faster. You will probably wind up with a couple of different sized trowels in your tool shed. Pruning, deadheading and shaping plants goes on all year in the garden. Good pruners will not only make your job easier, it will make a cleaner cut on the plants and not tear or rip. Basically there are 2 types of pruners: anvil and bypass. Get description from preference. Look for pruners with replaceable parts and blades that can be sharpened. Pruners can be costly, so try holding a few different pruners to see what feels comfortable in your hand. Weeds are a fact of gardening life. Hoes can make quick work of weeds. They can also be used to break up soil that isn't to compacted. For strength, look for a rolled steel blade that is riveted to the handle. Smaller blades allow you to get in between plants. Nothing works as well as a fork to break up soil. Garden forks are slightly shorter and thicker than pitch forks. The strongest have square, rather than flat tines. A garden fork can usually take the place of a spade, if it's the right type of fork. Yard rakes will help you get fall's leaves out of your gardens and also collect all your garden debris. Tines with some spring can be used in the garden without too much damage to plants. 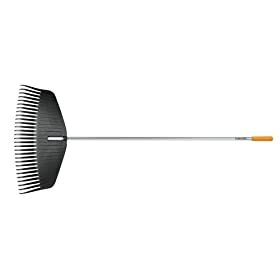 A narrow rake can maneuver around plants easier, but a wide rake makes quicker work of leaves. As with trowels, many rakes now come with ergonomic handles that put less stress on your back. You will also want a heavy metal rake. These are long and straight with teeth about 3" long. They are necessary to smooth out newly tilled garden soil and break up clumps. Toting things around the garden can really become a chore without the aid of a wheelbarrow or cart. Plants, soil and compost all have to get to your garden somehow. The size of your cart will depend on the size of your garden. While bigger may seem better, don't get something so large it becomes to heavy when full for you to move. Some things to look for in a wheelbarrow are: a stale stance, handles that extend all the way to the tire, an air filled tire and a deep tray. If you can afford it, o for the heavy-duty contractor's model or at least something with a reinforced undercarriage. two-wheeled garden carts are becoming more and more popular because the two wheels makes for a more stable ride with heavy loads. Look for large, spoked wheels for a smooth ride. Deep buckets are good for dumping. Flat beds are preferable for shoveling out of the cart. A good watering can will have a handle that balances in your hand. Handles that curve from the front of the can to the bottom make it easier to tilt. Again, large may seem better, but don't get a can that is so large you can lift it when full. When it comes to hoses price is often an indication of quality. Points to compare start with burst strength or how much pressure a hose can handle before it bursts open. 50 pounds per sq. inch is a good strength. The wider the hose, the more water can flow through it. ½ inch is fine, but 5/8 inch is better. Finally there is the material the hose is made from. Rubber will withstand the weather better, but the important thing is that whatever the material,,, it bee reinforced with a mesh layer. Finally, look for one that claims to be kink resistant, to make your life easier. When shopping for long handled grass shears look for a lightweight tool that is a good comfortable length for your height (you don't want to be hunched over while trimming). The blades need to lock closed for safety and the cutting mechanism in the handle should be easy to use and comfortable for your hand. For keeping the grass cut crisp along the edge of your lawn, turn the blade to the 45 degree angle. Use the handle to open and close the blade while sniping along the grassy edge. I always get pieces of bark stuck on the blade. Those pieces are too big to cut through and I like to wear gloves so that I can knock the bark off and keep my hands protected from the sharp blade. I like to use my long handled grass shears with the blade in a horizontal cutting position for mowing small patches of lawn, deadheading herbs and perennials, and cutting back ornamental grasses in late winter. Use an adjustable rake to clean up all of your trimmings. Once you have found a comfortable and sturdy pair of grass shears, you must take care of them so that they last as long as possible. Because the blades, and possibly the handles, of your shears are metal, they will be susceptible to rust. After each use, take a soft cloth and wipe down all the areas of the shears that may have touched grass or been in contact with your skin. The moisture in the grass can lead to rust, and the combination of sweat and body oils can also be detrimental to the life of your gardening tools. Once you have cleaned the grass shears thoroughly, store them in a clean dry place, or stick them, blades first, in a bucket of clean sand. When we perform crouching or squatting movements whether done in a prolonged fashion or repetitively, you may feel weakness, discomfort or pain in the hips, groins, front of the thighs as well as along the inner aspect of the thighs and perhaps even knee pain. This should tell you that the muscles in these areas were abused by the crouching or squatting positions. The muscle responsible for discomfort or pain at the front of the thighs or pain in the front of the knees is the rectus femoris muscle and the muscle at the inner aspect of the thigh and knee that has been stressed is the adductor magnus muscle. If pain is in the outer aspect of the knees, the pain is likely to be from stress to the tensor fascia lata muscle and if pain is at the back of the knees, the pain is from the hamstrings muscles. Although the other quadriceps muscles are important for producing anterior thigh and knee pain, they are not the main muscles to be injured since the other quadriceps cross only one joint namely the knee joint whereas rectus femoris (which is also a quadriceps muscle), tensor fascia lata and hamstrings cross both the hip and knee joints and are thus more likely to be abused with crouching or squatting. The international debate regarding the relationship between CTS and repetitive motion in work is ongoing. The Occupational Safety and Health Administration (OSHA) has adopted rules and regulations regarding cumulative trauma disorders. Occupational risk factors of repetitive tasks, force, posture, and vibration have been cited. However, the American Society for Surgery of the Hand (ASSH) has issued a statement that the current literature does not support a causal relationship between specific work activities and the development of diseases such as CTS. Back injuries frequently occur when people try to lift too much dirt, bags of fertilizer, or heavy pots without being in the proper position, or when they stoop, bend, or kneel in the same position for extended periods. Once you begin gardening, change positions every 10 to 15 minutes. During these brief breaks, stand up and walk around for a couple of minutes, which can help keep your back muscles loose. If you are going to kneel for long stretches, use a cushion, keep your back straight, and do not sit on your heels. Scientists claim the scent released from the grass works directly on the brain, specially affecting the emotional and memory parts called the amygdala and the hippocampus. After seven years of rigorous research, scientists now claim to have made a perfume, the "eau de mow" which "smells like a freshly-cut lawn", and helps relieve stress and enhance memory. Dr Nick Lavidis, a neuroscientist at the University of Queensland, Brisbane, developed the idea of the perfume, named Serenascent, after he trekked a US forest twenty years ago. The Telegraph quoted him as saying: "Three days in Yosemite National Park felt like a three-month holiday. I didn't realise at the time that it was the actual combination of feel-good chemicals released by the pine trees, the lush vegetation and the cut grass that made me feel so relaxed. " Guerrilla gardening is political gardening, a form of direct action, primarily practiced by environmentalists. It is related to land rights, land reform, and permaculture. Activists take over ("squat") an abandoned piece of land which they do not own to grow crops or plants. Guerrilla gardeners believe in re-considering land ownership in order to reclaim land from perceived neglect or misuse and assign a new purpose to it. Some guerrilla gardeners carry out their actions at night, in relative secrecy, to sow and tend a new vegetable patch or flower garden. Others work more openly, seeking to engage with members of the local community, as illustrated in the examples that follow. It has grown into a form of proactive activism or pro-activism. The earliest record of the term guerrilla gardening being used was by Liz Christy and her Green Guerrilla group in 1973 in the Bowery Houston area of New York. They transformed a derelict private lot into a garden. The space is still cared for by volunteers but now enjoys the protection of the city's parks department. Two celebrated guerrilla gardeners, active prior to the coining of the term, were Gerrard Winstanley, of the Diggers in Surrey, England (1649), and John "Appleseed" Chapman in Ohio, USA (1801). Some[who?] would consider the latter, John Chapman, not to be a guerrilla gardener, as he was planting orchards on untitled land. 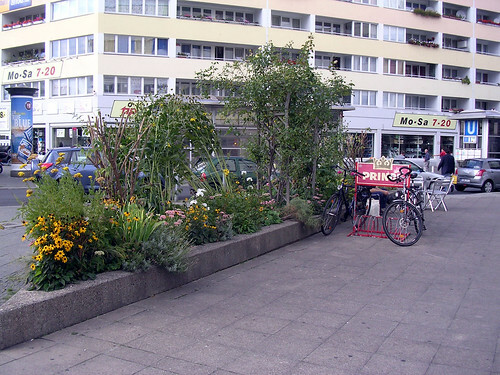 Guerrilla gardening takes place in many parts of the world. In Northern Utah, apple trees commonly grow along the banks of canals. Asparagus grows along the smaller ditch banks. Many of these plants were seeded 150 years ago by the workers who dug the canals, by burying their lunch apple core in the freshly dug soil or by surreptitiously spreading seeds along a new ditchbank. Guerrilla gardening continues today, as individuals secretly plant fruit trees, edible perennials, and flowers in parks, along bike trails, etc. Some guerrilla gardeners do so for the purpose of providing food. For example, the Tacamiche banana plantation workers in Honduras illegally grew vegetables on the abandoned plantation land, rather than leave with the plantation's closure in 1995. 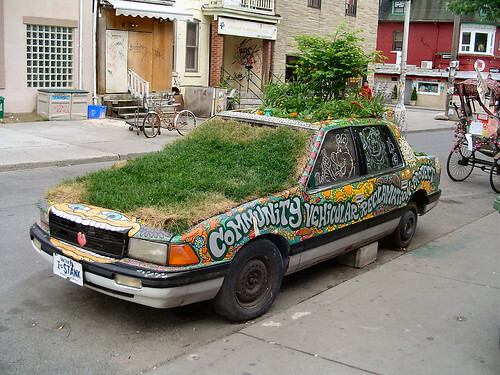 The term guerrilla gardening is applied by some quite loosely to describe different forms of radical gardening. This includes gardening as an entirely political gesture rather, than one with genuine horticultural ambition, such as the London May Day protest in 2000, when no long term garden was expected to take root. The term bewildering has been used as a synonym for guerrilla gardening by Australian gardener Bob Crombie. The play is set in a unisex hair salon in the city in which it plays. The landlady, Isabel Czerny, who lives above the shop is murdered and the audience gets involved in the action by questioning the actors and attempting to solve the crime. The characters include a flamboyant homosexual hairdresser and his flirty yet ditsy assistant, along with a prim and proper uptight older lady and an older man who is a "used antique dealer." Much of the dialogue is improvised by the actors, and the humor tends to revolve around topical references to current events. The ending of the play is different every night as audience members hear clues, question the characters and then vote on who they think is guilty. Whoever gets the highest votes is then "revealed" to be the guilty party, although the audience is not made aware of this fact.